Member for Corangamite Sarah Henderson and federal treasurer Josh Frydenberg met with an Ocean Grove small business on Saturday 6 April. 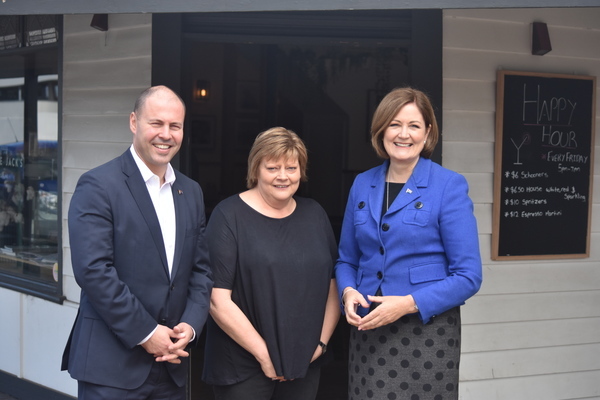 Ms Henderson and Mr Frydenberg, who delivered his first budget on 2 April, spoke with Helen Mahoney from Uncle Jack’s Ocean Grove about changes the government has made to small business owners. “There are over 18,000 small businesses in my electorate – many run by mum-and-dad business owners, just like the owners of Uncle Jack’s,” Ms Henderson told the Voice in a statement. “We talked to business owner Helen (from Uncle Jack’s Ocean Grove) about how the government has extended the instant asset write-off by increasing the threshold to $30,000 and expanding the businesses which can access it.